FEDERALLY LICENSED RETAILERS are required to run a background check through the FBI’s National Instant Criminal Background Check System (NICS)i when transferring a firearm to an individual. 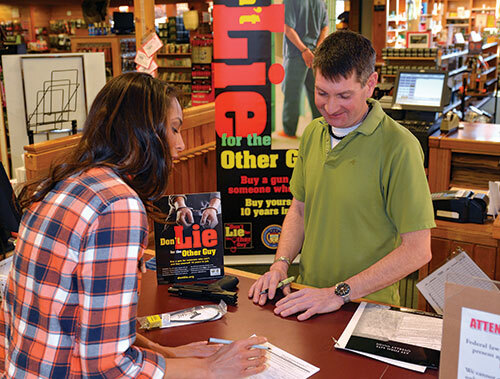 Firearms retailers rely on NICS to ensure the lawful transfer of firearms to law-abiding citizens. Over 302 million NICS background checks have been conducted from Nov. 30, 1998 through Nov. 30, 2018; about 24 million have been conducted through November 2018 alone. The firearms industry has a long record of supporting background checks.iii The NSSF-supported background checks prior to the passage in 1993 of the Brady Act that created a point of retailer sale background check system and NICS in 1998. The existing background check system must be fixed, however, before Congress even considers whether to expand background checks, otherwise we’ll just have more incomplete and inaccurate checks. FIREARMS & AMMUNITION INDUSTRY CAMPAIGN TO "FIX NICS"
The firearms and ammunition industry found the failure of states to submit prohibiting records unacceptable and launched a campaign in early 2013 to address the problem and improve the effectiveness of NICS. Through a multi-state effort focused on forming coalitions in the states with the fewest submitted records, the industry has dedicated significant resources to helping states overcome the legal, technological, and intrastate coordination challenges preventing effective record sharing. "FixNICSSM" is about keeping firearms out of the hands of prohibited persons, like the shooter in the Virginia Tech tragedy who was able to purchase a firearm from a federally licensed firearms retailer because his prohibiting mental health records were not in the NICS system. Since FixNICS was launched in 2013 through the end of September, 2018, the number of disqualifying mental health records submitted to NICS increased by 220 percent to over 5.3 million, from about 1.7 million in December 2012. This significant increase is driven by states like Pennsylvania, which now has 859,742 records, compared to 1 in 2012. New Jersey, another FixNICS success story, has now submitted 461,968 records, up from 17 in 2012, and is now ranked as the 2nd best state on a per capita basis. The FixNICS campaign has won victories in 16 states since 2013. NSSF-backed legislation has experienced unprecedented success across the country as the firearms industry continues to try to prevent prohibited people from gaining access to firearms. Since NSSF launched FixNICS in 2013, the initiative has seen great success on the state level. However, significant gaps remain on the federal level. A December 2017 report by the Defense Department’s Inspector General found that the military services failed to consistently submit records to NICS. The report showed about 31 percent of records were not submitted as required.vi The firearms and ammunition industry finds this unacceptable and worked to advance Congressional FixNICS® efforts to address gaps such as this. Thanks to these efforts, in 2018, President Trump signed into law a bill that included the Fix NICS Act. This measure, spearheaded by Representatives John Culberson (TX-07), Henry Cuellar (TX-28) and Senator Cornyn (R-TX), included enhancements for system availability, determination rates and e-check services. Most importantly, the federal law requires the Secretary of Defense to submit reports to Congress detailing the submission of records to databases accessible to NICS, directs the Justice Department to work with other agencies to submit all relevant records to the NICS database and to consult with state and tribal governments to provide training and technical assistance in completing NICS Initiative Grant applications. NSSF applauds the law and the resulting work that is occurring on the state and federal levels to ensure the strength of the NICS system. i There are 20 full or partial Point of Contact states, which have a state-designated agency responsible for processing some or all NICS background checks on behalf of the federal firearm licensees (FFLs) within the state. iii NSSF press release, “At NICS User Conference, NSSF Supports Virginia Governors Call to Add Mental Health and Other Records to Background Check System,” May 2012, https://www.nssf.org/nssf-supports-virginia-governors-call-add-mental-health-records-background-check-system/. v The National Shooting Sports Foundation obtained data on the number of active adjudicated mental health records in the NICS Index from the Federal Bureau of Investigation. vi Department of Defense, Inspector General, “Evaluation of Fingerprint Card and Final Disposition Report Submissions by Military Service Law Enforcement Organizations,” December 4, 2017, https://media.defense.gov/2017/Dec/05/2001852278/-1/-1/1/DODIG-2018-035.PDF.